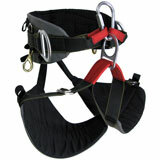 The leg straps are adjustable and include a quick release buckle. The leg pads feature extended cushioning at the inner thigh for superior support and comfort. 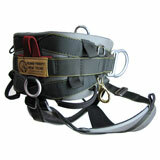 Double-density foam padding on both belt and leg straps provide support, load distribution and long wear. The belt pad is 6" wide at the back, tapering to 4" at the front. 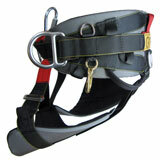 The cinch strap carries a stainless steel adjuster buckle. Rear rescue loop is rated at 5600 lb breaking strength.